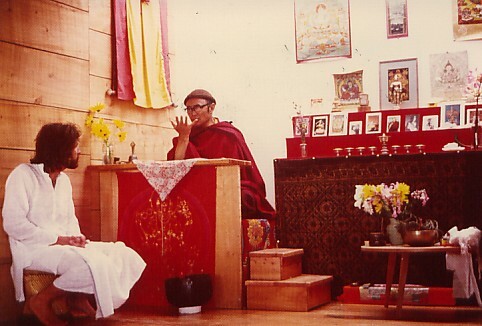 In 1978, Lama Karma Thinley Rinpoche visited New Zealand and opened a dharma centre that he named Karma Rime Thegsum Chökor Ling. The official opening ceremony was attended by more than fifty people and included the cutting of a ribbon by a representative of the local County Council. After this, Rinpoche gave a series of teachings on the Seven Point Mind Training with commentary by Jamgon Lodro Thaye, and several initiations, including Könchok Chindu. Rinpoche and the students made a yellow dharma flag and held a special retreat reciting 100,000 Guru Rinpoche mantras. As they finished, a small white rainbow appeared - a good sign. Rinpoche stayed there for a month and gave refuge to thirty-six people. 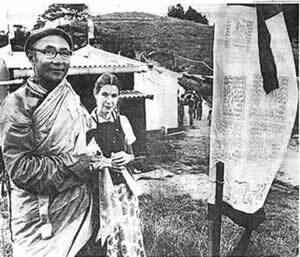 Karma Thinley Rinpoche had originally met his first western students, Elizabeth (Changchub Dolma) and David Cull (Könchok Gyurme) at the Young Lama Home School, in 1963. Before Rinpoche left for Canada, David told him that he wished to go to New Zealand and establish a dharma centre and residence for Rinpoche there. When David went there to look for land, Rinpoche asked him to find a location close to a city. David felt that mountainside land would be quieter and much cheaper, so Rinpoche suggested he look for a place with a view of the ocean. David found land near Auckland. The road leading to this was registered with the government as Bodhisattva Road, Taukapakapa. Rinpoche had previously directed David to make a chörten and given him the design and proportions, and he had made this by the time Rinpoche arrived there. He then asked him to make a twenty-five foot high Buddha statue, and selected and blessed the location for this. Rinpoche says that from his tent he could see the sun coming up over the ocean each morning, and so he picked that location for the site for the Buddha. He blessed it, burying a blessing vase and erecting prayer flags, and he filmed the ceremony with his movie camera. Later on, they did build a giant Buddha statue. Rinpoche says that he is happy that his dream came true. new Buddhist temple at Dairy Flat yesterday. One of the first Buddhist temples to be built in New Zealand was opened yesterday on a 40-acre property at Dairy Flat. About 50 people attended the opening of the brightly painted building which overlooks farmland. After a procession under an archway of palm leaves a Tibetan monk and teacher of the Buddhist philosophy, Lama Karma Thinley Rinpoche, welcomed the guests and led prayers and chanting. A member of the Rodney County Council, Mr. J. H. Bawden, and his wife were presented with Tibetan scarves as symbols of long life and material wealth. Mr. Bawden said the council had been diffident when the name of the road to the temple was suggested by the Buddhist community. But it had been pointed out that many Maori names were also difficult to spell. Bodhisattva Rd, leading to Karma Rime Thigsum Chöling, the temple, has now been officially approved. The temple itself was built almost entirely by one man. Mr. D. A. N. Cull, who paid for the land and building materials, is to hand over the temple to a trust so it can be used by the public. Mr. Cull met Rinpoche in India 10 years ago and, after learning meditation and the teachings of the Buddhist philosophy, began to discuss the possibility of building a temple in New Zealand. The community will produce its own food and power. An irrigation dam has been built in the valley in readiness for a garden. Trees are to be planted over the entire property. Mr. Cull said 10 retreat houses and five family homes would be built on the site. The temple and houses would be available to any spiritual group. The temple itself accommodates up to 12 people. The Buddhist community hopes to have a Tibetan refugee lama, or teacher, resident at the temple to hold group meditation and teaching.